Stanley peered up into the shadows above the stage. There was a colorful blaze of fabric amidst the burgundy curtains and canvas backdrops. He moved closer, trying to get a better view from a different angle. “No, it’s a drama,” Rosie replied. Rosie looked up to where he directed and saw the caftan and silk pants ruffling in the slight breeze of the theater twenty feet over the stage. Faye McMullen was murdered in cold blood at Winneshiek Theater and Mary O’Reilly and Police Chief Bradley Alden have to discover who done it before the murderer gets the chance to get rid of the prime witness… Mary O’Reilly. Immediately after finishing the third book, I curiously jumped into the fourth book. Within four hours, it was finished (yes, I should have been sleeping and now I'm running on about four hours of sleep because I got a little greedy). Was this book better than the one previous to it? Well, I have to admit that it was... but not by too much. However, I gave it a four star rating instead of two like I had the previous. The mystery of Final Call wasn't anything outstanding. A rude, arrogant, bitchy primadonna stage actress gets murdered and there are so many people who would have been her enemy. At the same time, we also see a separate side story where a reverend who appeared in the last book comes to seek Mary's help because he can't figure out why he's not going to heaven despite being so devoted to the church. It got a little fussy at times, switching back and forth from one major plot to a not so major plot that still got a lot of page time. If the reverend's plot had been downsized a little bit, maybe it wouldn't have felt so stuffy. The thing is, in the first few books, (especially the first book) two separate cases usually ended up tying together at some point. In this book, the two separate cases had nothing to do with each other. 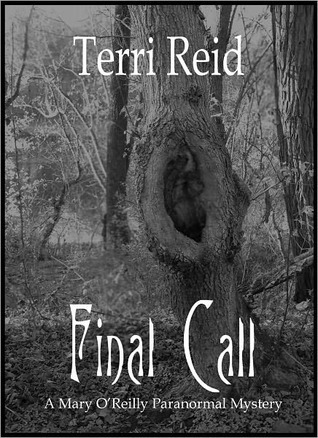 But that's fine, somehow it all still worked out because the character developments were astounding in Final Call. Bradley and Mary come to a hitch in their relationship when we finally reveal to Bradley that his wife Jeannine is already dead and Mary has known since the end of Book Two. New characters are introduced and each have their own little quirks. Mike the fireman ghost, at first I didn't like him at all because he seemed really smarmy; afterwards, I totally adore him because he's always there at all the right times AND he's got an excellent wit about him. Jeannine's ghost, at the very least, is a bit more realistic about what's going on than her husband is and not being a vengeful dead wife who wants to keep her husband for herself; I like that she's created as a good woman who had an unfortunate encounter with death. Finally, the newest addition who feels like he'll be another recurring character, Ian MacDougal has the makings for a likable partner. As for our recurring characters: Stanley and Rosie just keep getting better and better. Sean O'Reilly is an awesome big brother and I bemoan the fact that we don't get to see more of him. I mean, send a good looking Scottish young gentleman who is also a professor my way and you will be my favorite big brother in the world. Really. And while I'm not a big fan of romantic angst, I think our couple needed this separation, which will hopefully finally bring about some closure in the entire thing--Bradley needs to move on, Jeannine needs to move on. It's just too bad that Mary had to get caught in this family dilemma just because she fell in love with the jerk. So this time around, even if the story wasn't the best and the two cases seemed a bit messy, the characters of the Mary O'Reilly universe really made up for all of it. I'm a sucker for well-written characters with good development and progression. The story was also okay, so everything just fell into place wonderfully.